For years there has stood upon the statute books of the State of Illinois law regarding the employment of children tender aged in the factories and workshops of this State. For some time after the passage of this law its enforcement was lax, there was no one detailed specially for the work, and the result was that the statute was almost flagrantly violated throughout Chicago. Under Mayor Washburne I was assigned to the Board of Education to enforce the compulsory education law and the law regarding the employment of children of ages less than 14 years. Previous ti that time I was one of the five women sanitary inspectors working out of the Health office. From time to time the Board of Education received letters telling of pitiable cases where children were compelled to work long hours to provide food for crippled mothers and fathers. Many of these cases were turned over to me. In the course of time the complaints increased at such an alarming rate that I was not able to do both the work of sanitary inspector and enforce the child labor law. Eventually I was transferred to the Board of Education and made the work of child labor and truancy, as well as compulsory education, my sole field. The sights to be seen in the slums today can in no way compare with those of ten years ago and the suffering due to the inability of the older members of the family to work is, indeed, pitiable. Children were found working in factories all over the city, the frail little things in many cases being under 7. The pittance of 75 cents or $1 a week, however, helped to buy food for a sick mother, though it was at the cost of health and education. When the work was first begun a woman wearing a police sergeant’s star was a novelty. Manufacturers in some cases were not inclined to admit me to their workshops, but armed with the strong arm of the law and the will to do good I soon found that in most cases the merchants met me half way and rendered me great assistance. As a result the children were gradually thinned out, and the employers became accustomed to asking for affidavits required by law before work was given to children. Mothers had to depose as to the children’s ages, and with these papers the latter were enabled to get employment in the larger factories and stores. The good feeling promoted at the start of my work helped me immensely, and I can safely say that thousands of children were taken from work and sent to school without my knowledge. The manufacturer and shopkeeper took the law to heart and the children of tender age were rapidly taken from work and given a chance to learn. I have been doing the work for the Board of Education now for ten years and have never met any trouble owing to the changes of administration. All the superiors under whom I have worked have been most kind to me, and this treatment could but work to good advantage in discharging the duties of special officer for the board. Unpleasant features which were met with at the start have been eliminated, and the law is now as thoroughly obeyed as any on the statutes. Spectators stared for the “sergeant” was a handsome, dark-eyed woman, stately, graceful, and no more entitled, apparently, to military or police honors and title than any other attractive, peculiarly feminine creature in black skirt and hat and white shirt waist. But the title, well earned and merited, was rightfully given. “Sergeant No. 97,” so the handsome, gentle voiced, dark eyed woman—Mrs. Marie Owens in private life—is rated on the books and pay roll of the Chicago police force. 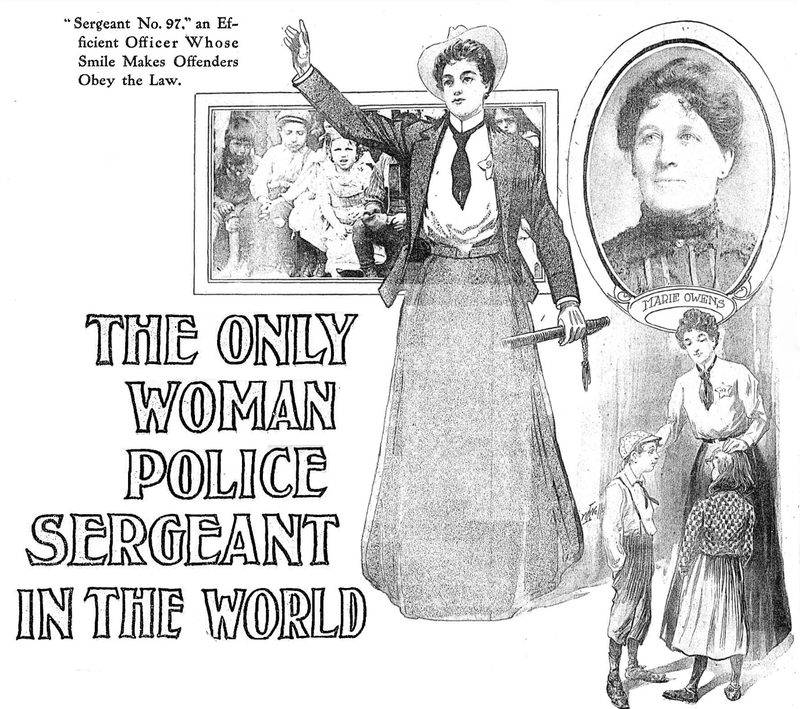 And “Sergeant No.97” is said to be the only feminine police sergeant in the world. Back of her unusual distinctions lies an interesting story of a woman’s fitness for unaccustomed and unfamiliar work. A long time ago, in the days when the elder Harrison was mayor of Chicago. In 1889 to be specific, five women were appointed as special health officers to look after the sanitary conditions and environments of the women and children working in the large stores and factories of Chicago. Mrs. Owens, one of these women, had been recently left a widow with five small children, not one one of whom can now remember the dead father, to rear and support. Never before, as she herself says, had she “earned a penny”; never before faced the battle of life in the business world’s arena. But she set to work with a vim and energy that soon placed her in the front rank of feminine workers, and she displayed such zeal and energy in behalf of the child toilers of Chicago, together with such tact and moderation, that she speedily won recognition as a real power in industrial circles. Then, two years after the beginning of the public efforts, came her broadened opportunity and the patrolman’s star. Mrs. Owens, now familiar with labor conditions as applied to women and children all over Chicago, was asked to take special charge of the complaints coming in to the health department in regards to children under 14 years of age working in the factories and stores. The law forbidding child labor had long lain dormant; it was deemed necessary to have police authority back of the woman official, who might find it difficult otherwise to secure obedience to her commands. So Mrs. Marie Owens became “Sergeant No. 97,” with the salary, star, and rating of a special police officer, and was attached to the detective department. As a member of this department the wearing of “plain clothes” was allowed her, so no suggestion of uniform has ever been adapted. Even the big star, while always somewhere about her person, is seldom displayed by Mrs. Owens, never unless this becomes absolutely necessary. Tactful, persuasive, able to see both sides of a difficult case, the “friendly policeman” rarely finds it necessary to fall back upon the police department. Her kind heart, pleasant ways, and “woman’s weapons” usually win her cause. “O, yes, Mrs. Owens is qualified to make arrests and perform all the duties of a patrolman,” says Lieut. Andrew Rohan, to whom Mrs. Owens reports on pay day. “In fact, she is a patrolman, gets the salary, has the rank, and all. Of course, it may seem a little queer to talk a woman being a ‘policeman,” but then—when a woman is killed the murderer isn’t indicted for ‘womanslaughter,’ is he? So what’s the matter with ‘patrolman’ for Mrs. Owens? All over the city does this work take “Sergeant No. 97”; from all parts of the working world come requests for her assistance, complaints for her investigation. She foes her work in her own way, being directly responsible to no one so long as it is effectively performed, because she has long since proved her ability in this direction. Laws Prevent Another Woman Sergeant. “Carried over,” because of the peculiar and well proved fitness, when the civil service rules went into effect, Mrs. Owens has always been retained on the police force instead of being offered a position as factory, tenement, or child labor inspector. But the civil service rules now making provisions for similar trained effort on the part of other women, will forever prevent the appointment of more feminine patrolmen. Mrs. Owens will undoubtedly remain as she has been for fifteen years, the only woman police officer in the world. The little “very own” children for whose she labored so hard and devotedly in the beginning have grown up in the interval since her appointment, the youngest of all, the tiny girl baby, being now 17 and fast blossoming into a skilled musician. But the devoted mother works on just as hard and devotedly for the sake of the countless other little children and struggling parents who need her friendship and assistance, and she will probably continue to do this as long as the never too robust health so ably controlled by force of will and determination allows her. Just at present “Sergeant No. 97” is a little weary, and is planning to take a brief rest. Acts as Court Final Resort. “The court of final resort,” as a title, would suit Mrs. Owens and her work quite well as her official rating. To her come alike the distressed employe and the worried employer, each confident that she will be able to find some way out of the particular difficulties that beset them. And this, with the rare tact, energy, and good will that have so added to and aided her efficiency as a police officer, she is able to do. Many of the troubles and trials growing out of the sudden determined enforcement of the child labor law were long ago settled in some fashion, but of late a new crop has been engendered by the more recent law forbidding boys and girls between 14 and 16 years of age to work more than eight hours daily. Sometimes when the youthful worker is nearing the higher age limit, it is difficult indeed to persuade wither him or his employer that the law must be obeyed for a few weeks or months longer. Sometimes, again, real hardships would seem to result from too rigid enforcement of laws and regulations in themselves admirable. Many times foolishly selfish or ambitious parents will desire the children to work with no good and sufficient reason. Now and then an employer, although Mrs. Owens finds this unusual, will seek to evade the law. Never yet in all her fifteen years of police experience has “Sergeant No. 97” found it necessary to come to a direct clash with an employer; never yet has she made an enemy of a child or parent, although thousands of both have found themselves compelled to bend their will to hers. The working children of Chicago—for whose helping and benefit she has inaugurated and fostered many reforms—almost universally regard Mrs. Owens as a good friend and comrade, coming to her with all sorts of complaints and troubles. The working girls and women love her no less. Many hours each day—and sometimes far into the night—does she work for their protection and helping, and out of her long and varied experience she has acquired, in addition to a deepened, strengthened love of her fellows, two devoted enthusiasms and ideas. The first is in behalf and admiration of the Chicago police force, viewed as a whole, and of the masculine Chicago policeman, taken under separate consideration. Almost innumerable instances of distress, poverty, sickness, misery of many kinds come under the notice of Mrs. Owens and she has found Chicago policemen invariably and graciously quick to respond, out of salaries none too large or generous, in the sorrowful needs presented. No class of workers she believes, unless it be the Chicago firemen, is so quick and generous in this regard. And the second enthusiasm—a desire, a longing, rather—is for some fund or financial allowance out of which to relieve deserving and self-respecting poverty without red tape, formalism, or publicity. Men about the city hall have seen a tall woman, always in black, enter Capt. O’Brien’s office at intervals of the day. The door always is closed behind her and nothing is heard of what she says to the bead of the detective bureau. Sometimes, after one of her interviews, a pair of detective sergeants are called in, and they leave the old corridors with that heavy tread that betokens a mystery. Never, though, will they tell what mission they have been sent out upon, and so far as the woman in black is concerned, she has disappeared entirely. Much of Chicago’s best police work has been done in just that way, and all the time the woman in black has remained in the background. She seldom is seen in court—but almost every day she is in Capt. O’Brien’s office. Doing Police Work Fifteen Years. In those few words the directory of the city of Chicago gives the identity of the only woman detective sergeant in the world. And, strange as it will seem to some, she will be entitled to a pension from the city of Chicago within a comparatively short time. For fifteen years, Mrs. Owens has been doing police work for this city, and in all that time there never has been the slightest necessity to assail her record. The trial board is a thing absolutely foreign to her. Give me men like she is a woman and we will have the model detective bureau of the whole world. I must take my hat off to Mrs. Owens. Mrs. Owens is not at all different from other women, unless it may be she has a kinder heart. She is tall, large, and strong. Her hair is black, and her eyes—well, no person can tell the color of them positively. They are black when she is earnest, and they are eyes that any father who has abused a child would shrink back from. No one wants to face her black eyes, even an interviewer, for they fill him with the knowledge that he is confronted with a shrewd mind. There is nothing hypnotic about those eyes, but there is something there that the scientists have not learned a name for yet. To imagine them placed upon a criminal is to imagine a criminal tortured with hot coals. If the victim has been a man who has left a sick wife and helpless children to want Mrs. Owens’ black eyes turned upon him are worse than the hor brand. Yet her eyes never are cruel—except, perhaps, to the person with a cruel instinct, and to him, even, if he should study them, they would be his redeemer. Her eyes turn almost to a blue when she laughs or tells of some incident in her career that pleases her, and it it is not often during casual conversations that she reverts to anything but happy incidents. Capt. O’Brien sees more of the black in the eyes of this marvelous woman, and her other acquaintances see only the blue in them. At home, Mrs. Owens is the housekeeper, dusting the mantel pieces, the dressers, and the bric-a-brac, but at work she is the detective incarnate—shrewd and exacting, but always kind. When she finds a family suffering because of some recreant husband her pocketbook is always open and her eyes are blue, but when finally she lays her hands upon the husband her eyes turn black. It is not a time to discuss trivial things with her then, although if a reconciliation can be obtained it is Mrs. Owens, usually who obtains it. She owns her own home out on Turner avenue—a two flat building—and it would be hard to find neater apartments. In the family are two sons and a daughter, who having been a widow one year before she became a police officer. She had come to Capt. O’Brien with information that is sure to land a wife deserter in jail when a Tribune reporter met her in the central station and asked for the story. Capt. O’Brien will have to authorize it, then. Get his permission and I will gladly tell it to you. Capt. O’Brien permitted her to tell the story, although the man he was seeking had not yet been arrested. But it was a story that revealed Mrs. Owens in her true light. Up on the north side a sick wife and four babies has been abandoned and left to starve and to die. The husband had worked in a downtown business establishment, but when it was learned that he had not shown up there the police were told of his disappearance, From the start it was thought to be a case desertion, and Capt. O’Brien, as head of the detective bureau, placed Sergeant Detective Owens on the case. For an entire week Mrs. Owens supported the family from her own purse, and in the meantime interested women of greater wealth in the sad conditions that existed, and now she has been relieved from further personal expenditures. All the while she was doing detective work, and it was she who located the runaway husband in an exclusive south side club. I like to do police work. It gives me a chance to help women and children who need help. Of course I know little about the kind of work the men do. I never go out looking for robbers or highwaymen. That is left for the men. Gives Money to the Poor. My work is just a woman’s work. In my sixteen years of experience I have come across more suffering than ever is seen by any man detective. Why, it has kept me poor giving in little amounts to those in want. I have yet the time to come across a hungry family that they were not given food. Certainly this only woman detective sergeant is an interesting character. Through all of her experience she has lost none of her womanly attributes, and other detectives in the central office lift their hats when they chance to meet her. She is the only getective sergeant at the central office who is not required to attend roll call, yet there is none more punctual in all her appointments than she. Regularly she reports to Capt. O’Brien at 8 o’clock in the morning and at such subsequent hours as is necessary. Until she goes home in the evening she has no resting place, except for the time that she has been eating her lunch. The men in the detective bureau have their squadrooms and chairs on which to lounge during the time they are resting, but there is no squadroom for this lone woman. Made Sanitary Inspector in 1890. I became a police officer by civil service before there was any civil service law put into effect. 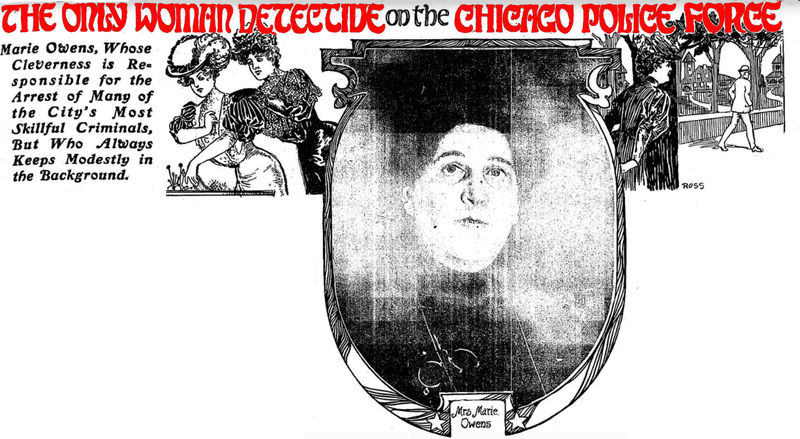 It may seem strange that I am the only woman detective sergeant in Chicago—and, I have been told, in the whole world—but, nevertheless, I was not alone when I entered the service. I was appointed with four other women, as a sanitary inspector in 1890, when the conditions in the stores and factories were such to appall the whole people. Those appointed with me at that time were Mrs. Byford Leonard, Mrs. J. R. Doolittle, Mrs. Ada Sullivan, and Mrs. Glennon. We formed the first board of sanitary inspectors that ever were given official authority in any city of the union. The members of the board were all women, and we were required to the commissioner of health. Why She Succeeds in Her Work. I put my whole soul into the work, and some places that were particularly bad I virtually put out of business because they employed nothing else but child labor. The law regarding child labor was not so strict then, but the city council had passed an ordinance forbidding the employment of children under 14 years of age unless there was some good reason why they should be compelled to work. It was up to us to know that reason, I visited the homes of the children so employed. If I found that the children were the bread winners of widowed mothers and dependent families I never interfered with their working, and right now many young men and women are holding high positions in the mercantile houses and big industries in Chicago because I did not disturb them. Put on the Face by Chief McClaughrey. The child labor laws should be written on India rubber that is flexible, so that the executive officers can stretch it a trifle. I made it a point to go after the fathers of these children who were sent out to work if that father was capable to take care of his family, and I had so many duch cases that Chief McClaughrey took notice of me, One day he sent for me, and I was employed as a police officer and sent to the detective bureau, where I had been ever since. In all these years I have done almost everything. Mrs. Owens goes about her work in a manner to indicate that it is not an unusual task. And for her it is not, for she has been doing it for years. Yet she is the only woman detective dergeant in the world, and few persons know that our police department can boast of having that distinction. Mrs. Owens is a police officer with all the authority of any bluecoat. Yet she wears her detective sergeant’s star concealed. Mrs. Marie Owens, 633 Sheridan road, though detailed from the Detective Bureau and said to be Chicago’s only patrol woman, will not be affected by an order Issued yesterday by Chief Gleason transferring thirty-nine detectives who failed to pass the examination for second class detectives to patrol duty. Men from the various police stations will take their places. The chief draws a distinction between patrolwomen aud policewomen. She retired in 1923 at the age of 70 and moved to New York to live with her daughter. When she died four years later, the obituary made no mention of her 32 years on the police force. 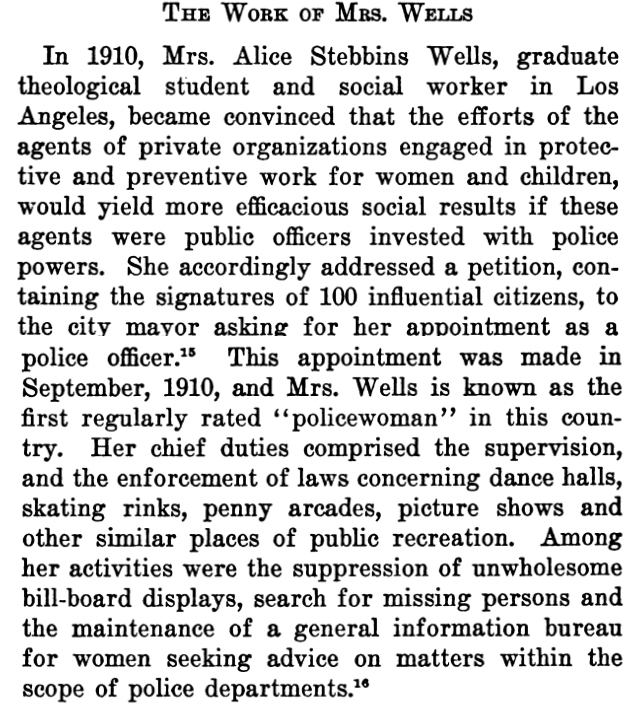 Chloe Owings goes on and gives credit to Mrs. Alice Stebbins Wells of Los Angeles as being the first police woman. Mrs. Wells, a contemporary of Mrs. Owens, went on lecture tours emphasizing the need for women on the force to deal appropriately with women and children and became very well known.